The new pedestrian bridge connecting Fayetteville’s Canal Landing Park with the Erie Canal trail opened officially on July 1, 2013. 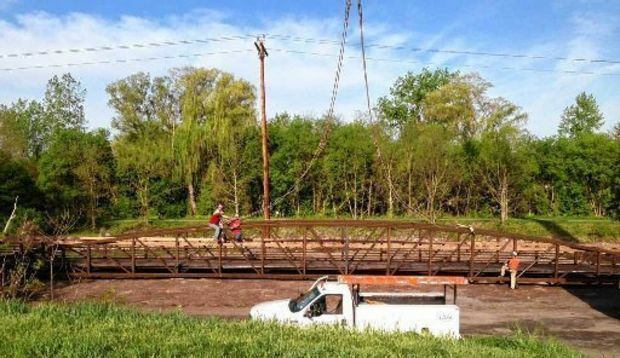 The bridge project, along with various other Canal Landing Park improvements, received two $150,000 awards from the Central New York Regional Economic Development Council. The Central New York Land Trust has asked the state for permission to build a mile-long hiking trail through the woods and wetlands of the Riverwalk Nature Preserve in the town of Clay. The trail would be built on about 100 acres donated to the trust in 2011 by the Bragman Companies, which built the adjacent Riverwalk development. That 178-home development was featured in the 2012 Parade of Homes. The trust’s land near the Oneida River has numerous wetlands, which are regulated by the state Department of Environmental Conservation. Building the trail would require a number of bridges over wetlands areas. The trail, which has already been laid out, will meander through forest of old, large trees, including shagbark hickories, hemlocks and red and sugar maples, said Jeff Devine, executive director of the land trust. “The trail system will take visitors on an interpretive journey that highlights the various ecological communities and connects the interesting natural features of the site in a manner that preserves their integrity,” Devine said. Planning for the donation of the land and building of the trail started nine years ago, Devine said. He said he did not know when trail construction would start or when the trail might open to the public. “That depends on how quickly the permit gets approved,” he said. In 2006, students at the SUNY College of Environmental Science and Forestry studied the property and proposed a variety of plans for the trail. Copies of the plans are available in the DEC Cortland office. 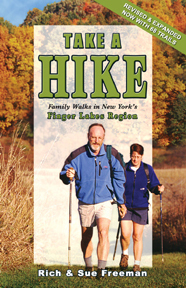 For other hiking option in Central NY, pick up a copy of Take A Hike – Family Walks in New York’s Finger Lakes Region. Walk/Bike CNY is a new website sharing information on walking and biking opportunities in the Syracuse area. In addition to highlighting the county’s trails, the site offers tips to stay safe while walking and biking.